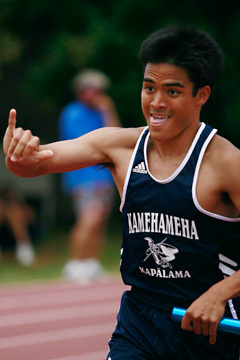 Kamehameha's Jeremy Kamakaala flashed a shaka as he led the pack in the 4x800 meter relay yesterday. The Punahou Relays don't mean a thing when it comes to league standings or championships. However, somebody forgot to tell that to the participants who went all out yesterday afternoon in a meet that featured record-breaking performances, as well as non-traditional events, which make the 61st annual event unique. Samantha Cabreros was honored with the Mary A.P. May most outstanding award for the girls after helping Punahou claim victories in four events -- two of which established meet records. Cabreros, Stephanie Ratte, Kim Culver and Marisa Schoen led the Buffanblu to a win in the 1,600-meter sprint medley in 4:12.62, breaking the record time of 4:15.27 set last year by Pac-5. In the 4x100 meter relay, Cabreros, Anna Hildebrand, Culver and Schoen crossed the finish line first in 50.98 seconds. Cabreros, a junior, also managed wins in the long jump (17 feet, 5 inches) and triple jump (37-10 1/2). The latter broke the previous meet record of 37-334 inches that stood since 1988. "I've coached Sammy since she was in seventh grade, and she's just phenomenal," Punahou coach Vern Hashimoto said. "I call her my money jumper, because if she's ever behind, she'll pull it out, like she did last year when she broke the state record on her final jump." The Punahou girls also took home gold in three more events: Alexa Untermann, Ratte, Culver and Schoen took the 4x400 meter relay in 4:07.65 seconds; Untermann also won the high jump with a mark of 5 feet; and Hildebrand soared over the bar at a height of 10-6 in the pole vault. Kahuku's Redmond Tutor took home the Robert Paris most outstanding award for the boys after he carried the Red Raiders to victories in three events. Suaesi Tuimaunei, Aaron Victorian, Tutor and Afa Bridenstine tied a meet record, winning the 4x180 yard shuttle hurdle race in 1 minute, 23.5 seconds. Individually, Tutor set the top mark in the long jump (22-9 1/4) and the triple jump (45-1134). The multi-talented athlete gave credit to Hashimoto, who has also been coaching Tutor once a week since December. "Without him, I couldn't have done what I did today," Tutor said. "He put in a lot of work with me. It has a lot to do with visualization. Just putting something in your head that gets you going, and lights that fire. Then you just let that fire burn throughout the event, and when the next event comes, you do the same thing." 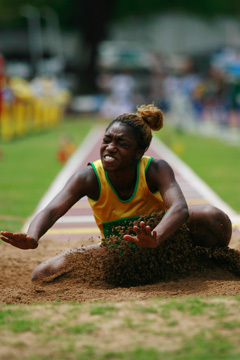 Leilehua's Vanessa Drake took second in the long jump at the Punahou Relays yesterday. Cabreros and Tutor attribute their success to Hashimoto's tutelage, especially when it comes to off-the-track workouts. The athletes performed "tactical strength and conditioning functional training" which improves balance, stability, and core and leg strength through the use of numerous tools, including medicine balls, free weights and balance pads. "The legs can absorb the landings better without buckling, and if you hit a hurdle (the runners) can come back in line again, so I would say that's the best training we ever did," Hashimoto said. There were no team results tabulated for the meet, but Kamehameha had the strongest male showing of the participating schools. The Warriors won the 4x200 meter relay, 4x800 meter relay and the 4x400 meter relay and finished second in the 4x100 meter relay and distance medley. "As soon as I get the baton, I just go out blasting," said Kinohi Warrington, the anchorman on the Kamehameha boys squad, which won the 4x200 meter relay in a time of 1:30.67. "My teammates really helped me out by getting and keeping the lead. This meet was pretty much like states, because there were a lot of OIA teams competing, too, so it was good to have the competition." The other members of the winning foursome were Gagamoe Manuma, Kamuela Brito and Noah Wong. "This was a really good gauge of how we're going to perform (in the ILH and state championship races)," said Jeremy Kamaka'ala, anchorman of the Kamehameha boys 4x800 meter relay squad, which won the race in 8:33.12. He was accompanied by Jesse Moniz, Kyle Pidot and Charlton Hee. "I think it will be a steppingstone as we go into the ILH and state championships," said Kamehameha head coach Sam Moku. "The boys worked hard, and have run track since they were in ninth grade and came up through the system, so this is the fruit of their labor." The title of Hawaii's Fastest Human went to Kelsey Nakanelua, who won the prestigious 100-meter dash in 11.20 seconds. The event, which Nakanelua has now won six times, is the only one that did not feature high school athletes. The most entertaining event of the day was the 6x67 meter "Power" relay, which featured teams composed of six runners, each weighing more than 200 pounds. Kahuku completed the race, which looked more like a herd of stampeding cattle than a track event, in 48.18 seconds. Possibly the biggest upset of the day came in the girls discus throw, where favorite Careena Onosai of Word of Life Academy fouled on all three of her qualifying throws, and opened the door for Kahuku's Aalona Ilissa, who won with a throw of 120 feet. However, Onosai did bounce back to claim the shot put competition with a throw of 40-2 1/4 inches. 4x180-yard shuttle hurdle--1. Iolani 'A' (Maggie Cannell, Rachel Won, Kate Cannell, Ili Wong), 1:44.1. 2. Radford 'A', 1:45.2; 3. Punahou 'A', 1:48.4. 4x100-meter shuttle hurdle--1. Iolani 'A' (Maggie Cannell, Rachel Won, Katie Cannell, Ili Wong), 1:09.3; 2. Punahou 'A', 1:13.5; 3. Radford 'A', 1:15.7. 4x200 relay--1. Mililani 'A' (Nicole Mitani, Pauline Paia, Britney Stephens, Isabel Romero), 1:48.49; 2. Radford 'A', 1:49.95; 3. Punahou 'A', 1:50.20. Distance medley--1. Pac-Five 'A' (Haley Abing, Jenna Matsumoto, Jennifer Tanaka, Julie Besenbruch), 13:01.11; 2. Campbell 'A', 13:26.11; 3. Punahou 'A', 13:34.55. 1600 sprint medley--1. Punahou 'A' (Samantha Cabreros, Stephanie Ratte, Kim Culver, Marisa Schoen), 4:12.62; 2. Leilehua 'A', 4:26.94; 3. Iolani 'A', 4:29.65. 4x800 relay--1. Pac-Five 'A' (Julie Besenbruch, Emily Latimer, Amanda Tamanaha, Haley Abing), 10:13.76; 2. Punahou 'A', 10:31.06; 3. Radford 'A', 10:40.95. 4x100 relay--1. Punahou 'A' (Samantha Cabreros, Anna Hildebrand, Kim Culver, Marisa Schoen), 50.98; 2. Kahuku 'A', 52.10; 3. Kaiser 'A', 52.37. 4x400 relay--1. Punahou 'A' (Alexa Untermann, Stephanie Ratte, Kim Culver, Marisa Schoen), 4:07.65; 2. Kaiser 'A', 4:12.58; 3. Waipahu 'A', 4:13.38. High jump--1. Alexa Untermann, Punahou, 5-00; 2. Lisa Gulmon, Punahou, 4-10; 3. Caroline Ritson, Punahou, J4-10. Pole vault--1. Anna Hildebrand, Punahou, 10-06; 2. Charina Sumner, Kamehameha, Nadia Romero, Mililani, 9-06. Long jump--1. Samantha Cabreros, Punahou, 17-05. 2. Vanessa Drake, Leilehua, 17-04.75; 3. Yasmina Taketa, Kalani, 16-03. Triple jump--1. Samantha Cabreros, Punahou, 37-10.50; 2. Vanessa Drake, Leilehua, 34-04.25; 3. Michelle Yoshida, Punahou, 32-05.75. Discus throw--1. Aalona Ilissa, Kahuku, 120-00; 2. Sharde Pratt, Kaiser, 106-11; 3. Charnelle Ioane, Kapolei, 104-01. Shot put--1. Careena Onosai, Word of Life, 40-02.50; 2. Megan Burton, Iolani, 35-05; 3. Charnelle Ioane, Kapolei, 34-07. 4x180-yard shuttle hurdle--1. Kahuku 'A' (Suaesi Tuimaunei, Aaron Victorian, Tutor Redmond, Afa Bridenstine), 1:23.5; 2. Punahou 'A', 1:25.9; 3. Kamehameha 'A', 1:27.5. 4x110-meter shuttle hurdle--1. Radford 'A' (Alexander Daniels, Nathan Blue, Shane Masaniai, Ryan Burciaga), 1:07.7; 2. Punahou 'B', 1:08.1; 3. Kahuku 'A', 1:09.5. 4x200 relay--1. Kamehameha 'A' (Parrish Brito, Noah Wong, Kinohi Warrington, Gagamoe Manuma Jr), 1:30.67; 2. Word of Life 'A', 1:32.31; 3. Radford 'A', 1:34.82. Distance medley--1. Iolani 'A' (Kevin Barr, Jonathan Takamura, Clay Ozaki-Train, Morgan Stephenson), 11:04.01; 2. Kamehameha 'A', 11:19.79; 3. Punahou 'A', 11:21.63. 6x67 relay POWER--1. Kahuku 'A' (Aaron Victorian, Joshua Wily, Sifa Heimuli, BJ Beatty), 48.18; 2. Kamehameha 'A', 48.66; 3. Nanakuli 'A', 50.02. 1600 sprint medley--1. Punahou 'A' (Matthew Tsujimura, Zach Coronas, Ben Strand, Peter Deptula), 3:37.96; 2. Pearl City 'A', 3:46.61; 3. Radford 'A', 3:50.09. 4x800 relay--1. Kamehameha 'A' (Jesse Moniz, Kyle Pidot, Charlton Hee, Jeremy Kamakaala), 8:33.12; 2. Iolani 'A', 8:38.34; 3. Roosevelt 'A', 8:42.06. 4x100 relay--1. Kahuku 'A' (John Cummings, Gary Nagy, Malosi Teo, Suaesi Tuimaunei), 43.22. 2. Kamehameha 'A', J43.22; 3. Punahou 'A', 43.62. 4x400 relay--1. Kamehameha 'A' (Parrish Brito, Kinohi Warrington, Jesse Moniz, Noah Wong), 3:24.73; 2. Punahou 'A', 3:29.02; 3. Word of Life 'A', 3:29.98. High jump--1. Jeremy Hayes, Radford, 6-04; 2. Aukai Lai, Waianae, 6-02; 3. Gary Satterwhite, Radford, J6-02. Pole vault--1. David Walden, Punahou, 13-00; 2. Jack Flemming, Waipahu, Gordon Cox, Waipahu, Joey Nagamura, Moanalua, Steven Bolosan, Moanalua, Christopher Lau, Punahou, Micah Swain, Kamehameha, Mahikumakani Crabbe, Kamehameha, Ryan Terao, Punahou, 12-00. Long jump--1. Tutor Redmond, Kahuku, 22-09.25; 2. AJ Clark, Mililani, 22-01.50; 3. Kealoha Pilares, Damien, 22-00. Triple jump--1. Tutor Redmond, Kahuku, 45-11.75; 2. Kealoha Pilares, Damien, 44-04; 3. Brandon Hardin, Kamehameha, 43-00.50. Discus throw--1. BJ Beatty, Kahuku, 157-04; 2. Adam Hom, Word of Life, 148-07; 3. Ryan Oda, Iolani, 141-07. Shot put--1. Aaron Watson, Nanakuli, 47-03; 2. Drew Uperesa, Punahou, 45-06.50; 3. Kapono Rawlins-Crivello, Kamehameha, 44-10.75. 100-meter dash preliminaries--1. Kelsey Nakanelua, 11.20; 2. Shawn Nakata, 11.38; 3. Ryan Schmidt, 11.41.